Not to brag, but I am one of the cutest puppies you'll ever lay your eyes on. I have an unusual blue-black tongue, but it works the same as other dog tongues. The Chinese Shar-Pei and the polar bear are the only other animals that I know about with such a uniquely colored tongue. I come in two coat types: a long, dense, stand-offish one and a smoother one, which is shorter and more plush. I make a very good watchdog. I'm quite independent though. I might be willing to fight for you, but I might not want to follow your rules! One other thing I would like to mention is that I really do not like the heat too much. If you live in an extremely hot climate and you want a Chow Chow, you'll need to let me live in the air- conditioned house with you or provide some sort of climate control for my dog house. When fully grown, I am between 18 and 22 inches tall (45.7 to 55.9 centimeters) and I weigh between 40 and 70 pounds (18 to 31.5 kilograms). We have no Chow Chow Breeders listed at this time. 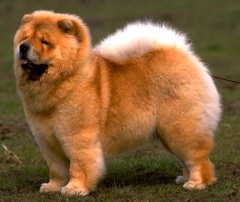 Click here to place your Chow Chow Ad!